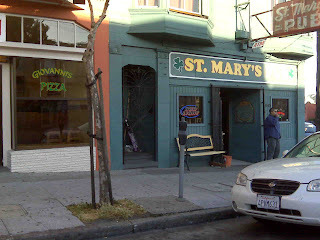 And the Mission has begun; first stop St Mary’s Pub at 3845 Mission Street. St Mary’s Pub is right on the corner of Crescent and Mission. From the outside this bar looks like it’s been a Mission fixture for years. My conversations with those inside confirm this. I think some have been frequenting the bar for just as long too. It’s a deceptively bigger bar inside than it lets on. There is an open area behind the bar with tall stools and tables, a juke box and a smaller area towards the back of the bar. There are several TVs around the bar and from the looks of it the SF Giants’ games are shown here. I, being a connoisseur of sport, asked that the channel be changed from whatever it was on to the Celtics game. This was received with no argument so I had the pleasure of watching the Celtics beat down on Detroit to win the Easter Conference Finals. I’m a Warriors fan but am rooting for the Celts as they fight their way towards an NBA Championship. This game spurred some light conversation with my new friends Jack, Kelly and Poncho. Jack and Kelly were more into the game than Poncho but we all managed to cheer on as the two teams struggled in the 4th quarter. This night was a night not as ordinary for the bar as there was a birthday celebration honoring Rocky and Richard. Rocky is one of the bartenders at St. Mary’s Pub and Richard I believe is a regular patron. This part was themed Mardi Gras and there were beads, masks and even gumbo to eat. I thoroughly enjoyed having all the activity around me. I had been to this bar once before last December and spoke with a few folks when I was there. After almost 6 months I never expected anyone to remember me from way back then and was surprised when ordering a beer from Gloria that her cousin Paulette recognized me. I was introduced to both of them by a fellow drinker back in December when I first made my way into this place. I was introduced to a couple other regulars back then who didn’t seem to be around this night. After a short conversation with Paulette, mainly saying hello, how are you? I made my way to the tall stools and tables. Looking around the bar you could tell that it has been around for a long time and some of the guests have probably been around and in their same seats for just as long. Everyone was very friendly and I had no trouble striking up conversation and hearing stories from back in the day. I even met a guy who works at one of the bars further down Mission Street. So now I’ve got a familiar face when I visit. So what did I take away from St Mary’s Pub? The People here were nice and very welcoming. I was offered a seat at the bar immediately, had the channel changed upon request and after only an hour was bought a beer by one of the regulars. All that and I got to watch the Celts beat the Pistons and move on to the finals. Another thing I learned this trip is that you can have quite a few drinks in only a couple hours especially when you’re chatting away talking basketball, San Francisco history, New Orleans history (Kelly is originally from New Orleans) and even get into it with a lady at the bar who couldn’t believe I was rooting for the Celtics because they reside in Boston and it’s a racist town. I was in Boston last year and have to say I enjoyed every minute of my trip. So there wasn't anything too crazy, wild or really all that strange in my first venture on Mission Street. I'm sure if I'd spent more time here there would be a couple more stories to tell. I'm not complaining though as this is just my first stop of many, many more to come. The picture is a nice touch. I like to be able to put a face or facade with a name.